The big bang is the foremost model that scientists use to describe the creation of the universe. This theory proposes that the universe was created in a violent event approximately 12 to 15 billion years ago. In that event, the lightest elements were formed, which provided the building blocks for all of the matter that exists in the universe today. A consequence of the big bang is that we live in an expanding universe, the ultimate fate of which cannot be predicted from the information we have at this time. Cosmologists (scientists who study the origin of the universe) believe the universe began as an infinitely dense, hot fireball. They call this single point that contained all the matter in the universe a singularity. Time began at the moment this fireball exploded, stretching space as it expanded rapidly. (Space into which the fireball exploded did not exist separately, but was a part of the fireball at the beginning.) The universe, at first no bigger than the size of a proton, expanded within a microsecond to the size of a basketball. Gravity came into being, and subatomic particles flooded the universe, slamming into one another, forming protons and neutrons (elementary particles that form atoms). and cooled enough for stars and galaxies to form. Our solar system, formed from a cloud of dust and gas, came into being a mere four-and-a-half billion years ago. A key assumption on which the big bang theory rests is that the universe is expanding. Prior to the twentieth century, astronomers assumed that the universe had always existed as it was, without any changes. In the 1920s, however, American astronomer Edwin Hubble (1889–1953) discovered observable proof that other galaxies existed in the universe besides our Milky Way galaxy. In 1929, he made his most important discovery: all matter in the universe was moving away from all other matter. This proved the universe was expanding. Hubble reached this conclusion by looking at the light coming toward Earth from distant galaxies. If these galaxies were indeed moving away from Earth and each other, the light they emitted would be stretched or would have a longer wavelength. Since light with a longer wavelength has a reddish tone, this stretching is called redshift. Hubble measured the redshift for numerous galaxies and found not only that galaxies were moving away from Earth in all directions, but that farther galaxies seemed to be moving away at a faster rate. By the mid-1960s, the big bang theory had received wide acceptance from scientists. However, some problems with the theory still remained. When the big bang occurred, hot radiation (energy in the form of waves or particles) given off by the explosion expanded and cooled with the universe. This radiation, known as the cosmic microwave background, appears as a weak hiss of radio noise coming from all directions in space. It is, in a sense, the oldest light in the universe. When astronomers measured this cosmic microwave background, they found its temperature to be just under −450°F (−270°C). This was the correct temperature if the universe had expanded and cooled since the big bang. But the radiation seemed smooth, with no temperature fluctuations. If the radiation had cooled at a steady rate, then the universe would have had to expand and cool at a steady rate. If this were true, planets and galaxies would not have been able to form because gravity, which would help them clump together, would have caused fluctuations in the temperature readings. In 1980, American astronomer Alan Guth proposed a supplemental idea to the big bang theory. Called the inflationary theory, it suggests that at first the universe expanded at a much faster rate than it does now. 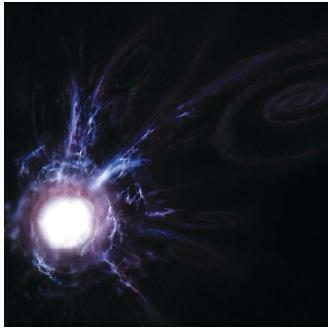 This concept of accelerated expansion allows for the formation of the stars and planets we see in the universe today. Guth's inflationary theory was supported in April 1992, when NASA (National Aeronautics and Space Administration) announced that its Cosmic Background Explorer (COBE) satellite had discovered those fluctuations. COBE looked about 13 billion light-years into space (hence, 13 billion years into the past) and detected tiny temperature fluctuations in the cosmic microwave background. Scientists regard these fluctuations as proof that gravitational disturbances existed in the early universe, which allowed matter to clump together to form large stellar bodies such as galaxies and planets. Present-day astronomers liken the study of the cosmic microwave background in cosmology to that of DNA (deoxyribonucleic acid; the complex molecule that stores and transmits genetic information) in biology. They consider it the seed from which stars and galaxies grew. To widen the scope and precision of that study, NASA launched a satellite called the Microwave Anisotropy Probe (MAP) in 2001. Orbiting farther away from Earth than COBE, the goal of MAP is to measure temperature differences in the cosmic microwave background on a much finer scale. Astronomers hope the information gather by MAP will reveal a great deal about the universe, including its large-scale geometry. i never would have understood the science theory for how the universe was formed, if not for this. can you please explain the big bang theory of earth more simple?whats the other theories of earth? I always found it fascinating that if matter could neither be created or destroyed how does it exist. This leads me to believe two possible theories; We are non-existent and just a blank space in the universe or Matter could be created and destroyed but only under certain circumstances. This seems more logical since the facts on this site state that it started from a proton and then expanded to form the atoms and elements in existence today. So it would potentially disprove the theory of law of conservation of mass which would then prove my hypothesis. But I'm only 14 so would someone please help a man out?